Humans aren’t the only animals with yen for self-decoration. Caddisfly larvae protect themselves by constructing elaborate armors from gravel, sand, twigs, and other debris, which they “glue” together using excreted silk. The tiny moth-like insects scavenge whatever material is suitable from their environments, including anything you choose to give them. French artist Hubert Duprat was among the first to take advantage of the insects’ predilections by supplying them with gold flakes, opal, turquoise, rubies, and pearls. The resulting cases are intricate works of art that can be strung up like beads to create one-of-a-kind jewelry. Hubert Duprat discusses the caddisfly 2:34 mins into the video. Caddisflies, also known as sedge-flies or rail-flies, are an order (Trichoptera) that comprises nearly 12,000 described species. Exclusively aquatic, their larvae are found in a variety of habitats such as streams, rivers, lakes, ponds, and vernal pools. Not all caddisfly larvae are underwater architects: some species construct nets, while free-living caddisflies retreat into structures only prior to pupation. Once fully developed, most pupal caddids chew through their cases, swim up to the water surface, and slough off their skins before emerging as fully formed adults. Duprat views his work with caddisflies as an equal collaboration. “I am playing a bad trick on them,” he said in 2011. Here in the United States, Kathy Kyle, founder of Wildscape started working with the caddisfly in 1995 when her then-husband, biologist Ben Stout, observed the critters in action. It took three years of trial and error for the couple to simulate the caddids’ stream ecosystem but Kyle is now able to ply her “pets” with gemstones, seashells, and even fossilized animal dung to produce one-of-a-kind necklaces, earrings, key chains, and zipper pulls. I think it's horrible. One more example of humans using animals. There's nothing eco about this. I think it's wonderful! One more example of humans and animals creating art in harmony. This is what eco is about! I don't think it hurts or worries the caddis flies at all. They just need material to make their pupae and anything will do - grit, shells, etc, or precious gems will make no difference to them as long as they're good construction materials. And the materials being given to them are natural - gold and jewels - not synthetic or man made like plastic beads for example. 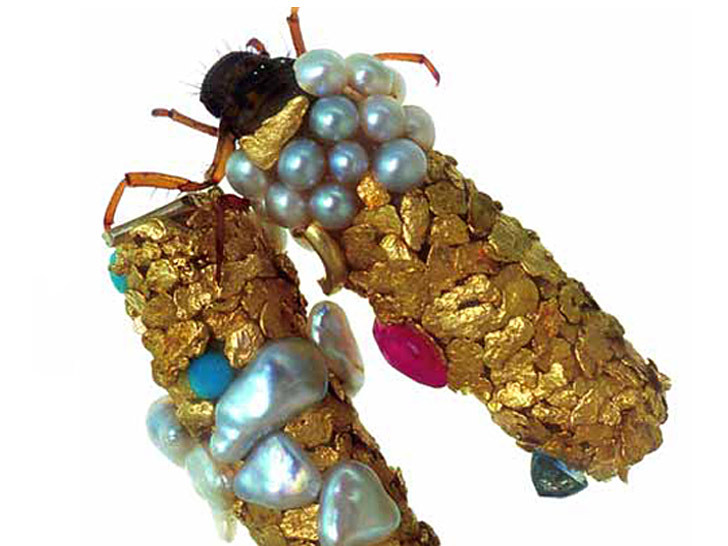 So I don't see why this art form is not eco-friendly, and Hubert Duprat totally gives the caddis flies the kudos for creating these lovely pieces of jewellery. They don't need them once they finish with the pupal stage but have had full use from them in the meantime. WildScape Incorporated is a business that focuses on environmental education. The caddisfly larva is an environmental indicator! They tell us the quality of the water they live in... They are a beautiful insect that creates beautiful art. I give my caddisfly larva a environmentally safe place to live and create their unique pieces of art. I then raise my caddisfly larva until they emerge as adults. Their cases are left behind to remind us that there is so much beauty in nature. I create unique jewelry that is made using the cases of the caddisfly larva... They are beautiful Look me up at Wildscape.com! A+ for originality! These are true little works of art, beautiful. Humans aren't the only animals with yen for self-decoration. Caddisfly larvae protect themselves by constructing elaborate armors from gravel, sand, twigs, and other debris, which they "glue" together using excreted silk. The tiny moth-like insects scavenge whatever material is suitable from their environments, including anything you choose to give them. French artist Hubert Duprat was among the first to take advantage of the insects' predilections by supplying them with gold flakes, opal, turquoise, rubies, and pearls. The resulting cases are intricate works of art that can be strung up like beads to create one-of-a-kind jewelry.